The story of VVT will teach you how to create a accessible workplace and how to Hire & Retain Productive People with Disability. Below is a excerpt from the book. Our mission is to help disability hiring become a valuable part of HR standards and practices. Our short-term goal is to educate, educate, educate-to teach you what is involved in this process and demonstrate how you can partner with outside resources to make it happen. 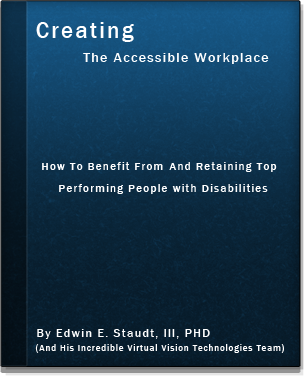 So we are revealing our own secrets, because it is so important that people with disability be allowed to enter and contribute in the American workplace... Order your free copy of the book 'Creating the Accessible Workplace' by filling out the form below. You can use this form to order a hard copy or a digital copy of The Story of VVT.